Price: € 14,95 from [AirDoc] Aircraft Documentations and £9.99 from Hannants. This volume, the latest Bildband (Picture Book) from Andreas Klein's AirDOC, is dedicated to F-4F and RF-4E Phantoms of the Luftwaffe. Not all F-4s to be fair, but specifically those in Norm 72, the splintered Olive Green/Basalt Gray over light gray scheme carried over in Luftwaffe service from the F-104 and pre-dating that late 80s tendency for all things fast jet to be in some tactical lo-viz gray scheme. As the title implies this is primarily a picture book, with its 72 pages featuring on average two large clear full colour photographs of the subject aircraft. The book is organised with each section covering a single unit so included in this volume are great shots of Phantoms from JG71 "Richthofen", JG 74 "Molders", JaboG 35, JaboG 36 "Westfalen", AG 51 "Immelmann", and AG 52 "Panthers". No WTD 61 though but they are more than adequately covered in the same publishers history of that unit. Each photo has a detail caption in English and German adding useful reference tidbits to support the image. 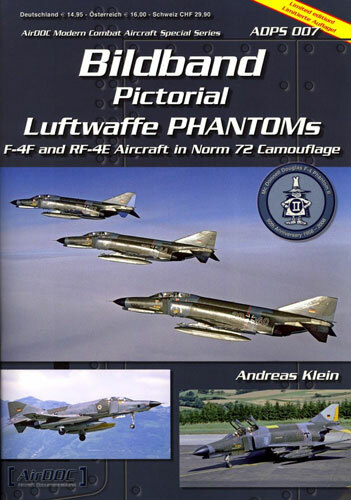 This is a great reference for modellers and nice picture book for Phantom enthusiasts.